Hubby and I didn’t want to drive far from our house but we also did n’t want to brave the hordes of people who troop to SM Aura on weekends (and here I am, eating my words that Aura is my favorite mall because it’s not crowded) or eat at old favorites over at Serenda/High Street. The process of elimination brought us to the rows of restaurants at The Tuscany in McKinley Hill. We just had ramen two nights within the week so that crossed out the ramen place, and hubby kept referring to ribs and steaks so we ended up at Marciano’s. Now, I’ve never been to this place; hubby had though. Interior was nice, quite minimalist, with big picture windows looking out onto the street or onto the rows of condominiums; menu looked appetizing and as it was past 2PM and we haven’t eaten lunch, we decided to have a little feast. 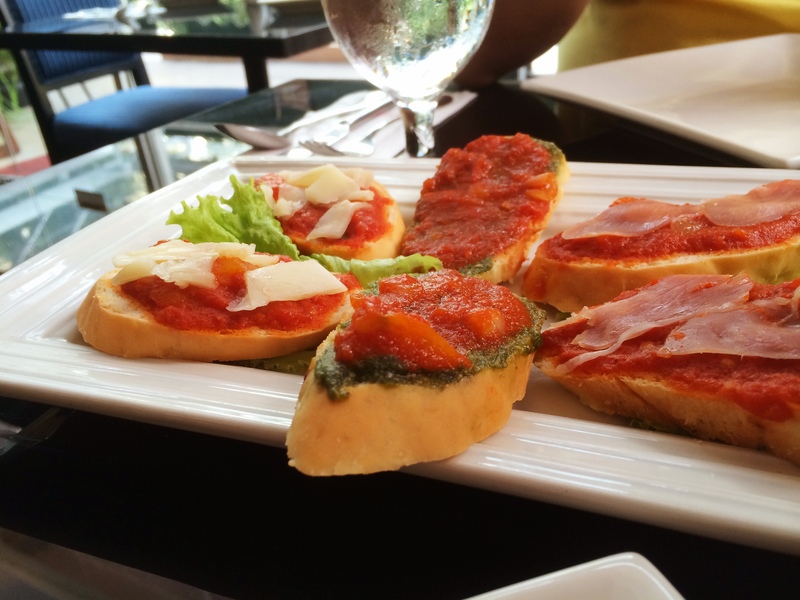 For starters, we got the bruschetta – a plate of six bruschetta spread with generous heaps of tomato sauce. A pair was mixed in with parmesan and salsa, another with slivers of cheese, and the other with thinly sliced smoked ham. Not bad, although I would have added a pinch of salt or pepper since the tomato sauce was a bit overpowering. 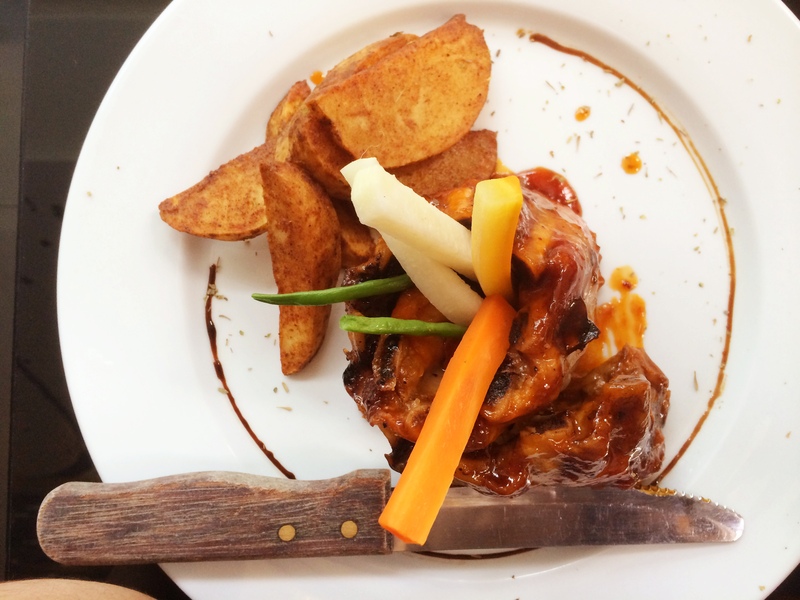 For our main course, we agreed on the pork medallion and baby back ribs. The plated entrees looked lovely but that was about it. The pork was a bit hard and bland; hubby, who rarely drizzles salt and pepper, took it upon himself to put generous amounts of salt and pepper. I honestly could not figure out what I was supposed to taste because I couldn’t taste anything but rubbery pork. 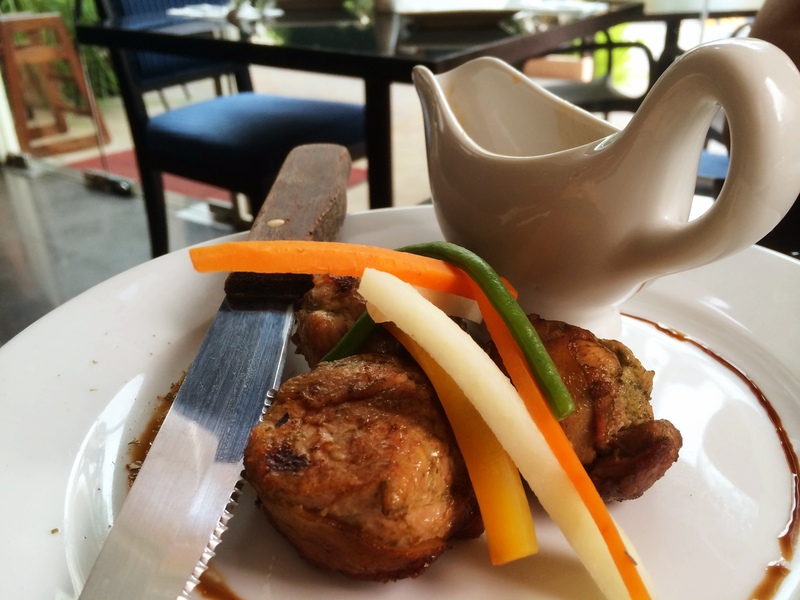 Pork Medallion with gravy, Php 308. Here’s the succulent looking baby back ribs. 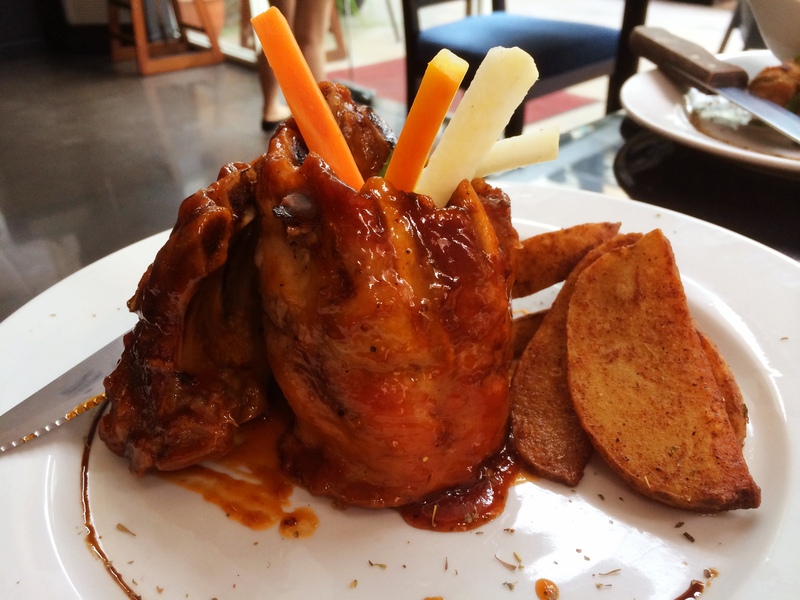 Baby Back Ribs with Potato Wedges, Php 408. Top view. The baby back ribs also fell short of expectations. Like the pork medallion, it lacked flavoring, even though it looked tasty with all that glazed sauce coating it. On the bright side, at least it was well-cooked. The potato wedges were meh. Prices were quite reasonable given the huge servings but given the taste, I would say it’s overpriced. Probably won’t be back here in the near future.